Rep. Rashida Tlaib (D-MI) was interviewed on "the Circus" on Showtime. 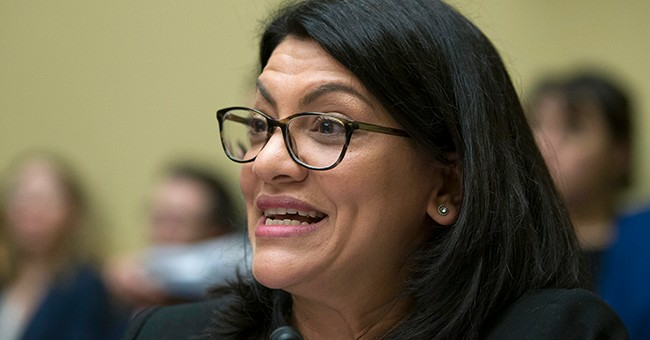 During the interview, Tlaib explained to host Alex Wagner why she believes Americans are so upset by Rep. Ilhan Omar's (D-MN) anti-Semitic comments. "Rep. Omar...Why do you think people in your own party reacted so strongly to what she said?" Wagner asked. When the House passed their resolution condemning religious hatred, a full on brawl broke out. Democrats didn't want to name Omar out specifically so they muddled the resolution's language down to include all religious groups. What Omar said was wrong. What Omar said was anti-Semitic. Making the assumption that being pro-Israel means someone holds their allegiance to Israel over the United States is absurd. She deserves to be called out for what she said. People didn't wake up one day and decide to attack Omar because she's of Islamic faith. People are attacking her anti-Semitic stance, which she has repeated over and over again. The fact is simple: Omar and Tlaib don't understand being pro-Israel and wanting to protect the Jewish people from persecution. Instead of trying to understand why their thought process is wrong and how their words impact others they're doing everything in their power to turn themselves into the victim. Newsflash: you're not the victim in this. Stop trying to play the victim card.